With more businesses committing to the Courtauld Commitment 2025 Water Ambition today, WRAP discusses the ongoing Water Ambition projects aiming to mitigate current water pollution and water wastage rates. The Office for National Statistics now estimates the value of freshwaters for the whole of the UK is £39.5 billion. The UK’s water catchment areas are delicate environments. Despite water quality in UK rivers having improved since the 1950s, latest figures show that 86% of river water bodies in England fail to reach Good Ecological Status. In 2017, WWF found that 14% of UK rivers were ‘over-abstracted’ meaning that water removal is causing rivers to drop below levels required to sustain wildlife. In England, agriculture uses almost 70% of land and accounts for over 50% of nitrate lost to the water environment, 25% of phosphorus and 80% of pesticides. The Committee for Climate Change estimates that the UK has lost 84% of its fertile topsoil since 1850. Erosion continues at a rate of 1 to 3cm each year. The impact on the environment of producing food and drink, both in the UK and overseas, will be reduced under a new Water Ambition launched today by sustainability experts, WRAP, in partnership with WWF and the Rivers Trust, as part of Courtauld Commitment 2025. Work is already underway in the UK locations, with established projects active on the ground through the Rivers Trust and other partners including BITC. The Water Ambition will act as a catalyst to help develop these projects by increasing industry participation, and generating new partnerships more widely. The projects aim to improve water quality and availability for local communities, for the wider environment and for greater resilience within supply chains. The Courtauld 2025 Water Ambition will see UK businesses act within their own operations, and in local catchment-based projects, to improve water efficiency and tackle water stress. 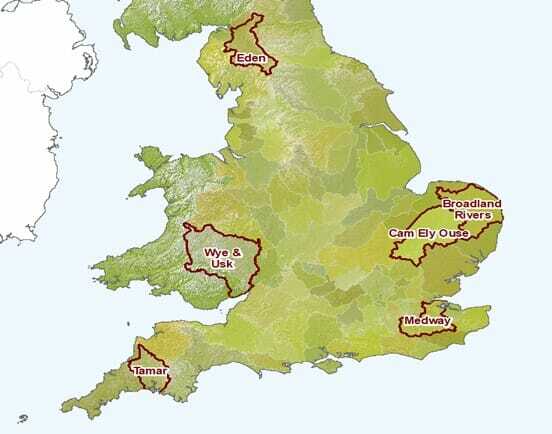 The initial focus will be on six UK catchment areas identified by the Rivers Trust as critical areas for sourcing key foods such as fresh produce, dairy and crops. All currently suffer water stress in terms of quantity and availability, or for the quality of current supplies. Cam & Ely Ouse / Broadlands (East Anglia) catchments: Coca-Cola has worked with WWF-UK and the Norfolk Rivers Trust since 2012 to support water sensitive farming practices in both catchments, which are key sourcing locations for its supply chains in terms of sugar beet. This has led to more than 280 million litres of water being replenished (equivalent to 112 Olympic size swimming pools). It has helped reduce agricultural pollution and improve water quality, and benefited farmers through adopting sustainable cost-saving practices. The work will continue and upscale the existing exemplary water-friendly farming work, which is supported by Coca Cola and Tesco. The Medway (Southeast): NIAB EMR is a Centre of excellence in research supporting the horticultural sector. It is in the process of establishing the Water Efficient Technology Centre. This will address issues of irrigation efficiency in the horticulture sector by developing, demonstrating and promoting best practice in integrated crop-specific production systems. Currently the work is focused within greenhouses, but working with the South-East Rivers Trust and Kent County Council the project will expand and extend this work to develop best practice for water efficiency and surface water management, and wildlife improvements, outside of polytunnels and greenhouses which can be shared. Tamar (South West): To date, the Wye and Usk Foundation (WUF), working with partners such as the Environment Agency (EA/Natural Resources Wales) Natural England, have worked with over 600 farmers, opened up over 760km of ‘new’ habitat, improved the riparian habitat of 309km and restored 63km of formerly fishless water in the upper catchment. This has allowed the establishment of a successful fisheries marketing scheme – which is attracting fishermen from around the world - which now providing the funds for ongoing maintenance. Eden (Cumbria): In the Eden catchment, BITC are working using the landscape enterprise network analysis (LENs) to establish the commercial interest for a network of businesses. The LENs approach has been developed by BITC, Nestle and 3Keel and an assessment for Cumbria was undertaken in 2017, establishing the shared interests of six businesses in the area. In the next phase this analysis will be expanded to more businesses, to deepen understanding of how business values natural assets in this catchment. Wye & Usk (South West / Wales): This project will support and expand the range of best practice initiatives available to reduce the impact of agriculture, particularly from dairy farming and build water resilience within the catchment. • Spain produces 20% of the UK’s imported fruit and vegetables, but 12% of its cropland is at high water risk. • South Africa produces 20% of our imported oranges and other citrus fruit but 13% of its cropland is facing high water risks. • Kenya produces 36% of the UK’s imports of green beans, and some of Kenya’s agricultural areas are suffering from water risks. Our international water ambition projects will enable businesses to act in these key sourcing locations, by joining or initiating projects in priority catchments and supporting good water governance at a regional and national level. These projects are currently under development.